For kids, Christmas is the most magical time of the year: the time Father Christmas comes with his reindeer to deliver gifts to all those lucky enough to be on the ‘good list’. As the days count down their thoughts turn to all these wonderful gifts beneath the tree and their excitement can barely be contained. So what to do if you’ve got a house full of excited kids and need to get out? Well, thankfully, there’s plenty going on in London this Christmas season to keep them occupied. The traditional Christmas pantomime is a must for the young and old alike. It’s a uniquely British tradition and despite being called old hat by some, each year theatres up and down the country put on spectacular new shows sure to keep the kids entertained for hours. Even after all these years, we all still love to shout ‘he’s behind you!’ and have a good old sing-song with some strictly Z-list celebrities. 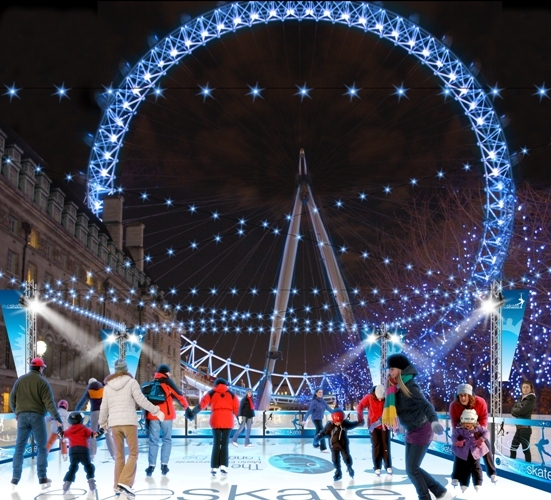 Lots of temporary outdoor rinks are put up especially for the festive season in London at such stunning venues as the Natural History museum and Somerset House, as well as the many permanent ones already here. There’s nothing quite like taking to the ice to show off your skating skills and in many cases making a mess of it. Ice skating really is a truly magical Christmas experience you’ll remember long after the bruises have disappeared! The world-famous Kempton racecourse may not be the first place you think of when it comes to Christmas but with reindeer racing and lots of other Christmas activities on this festive season it’s sure to be a hit with both parents and kids alike. Conveniently located just outside of the hustle and bustle of central London, Kempton boasts excellent food and drink set in gorgeous countryside surroundings and with a little bit of luck, some snow to set the whole scene off. If your kids are still young (and lucky) enough to be brought gifts from Father Christmas then there’s not much better than seeing the man himself in person. His elves guide you through Santa’s magical grotto where the children get to sit on Santa’s knee, make their wishes and, most importantly, get photographic proof that they’ve met the man in red. There are lots of grottos around London with major department stores such as Harrod’s taking part in the festive cheer. Shauna Price is a mummy blogger that loves to take her kids to new and exciting places, especially over Christmas. I appreciate a work of the all people that share information with me and others. My self really impressed with this blog. Great post on a subject close to my heart.